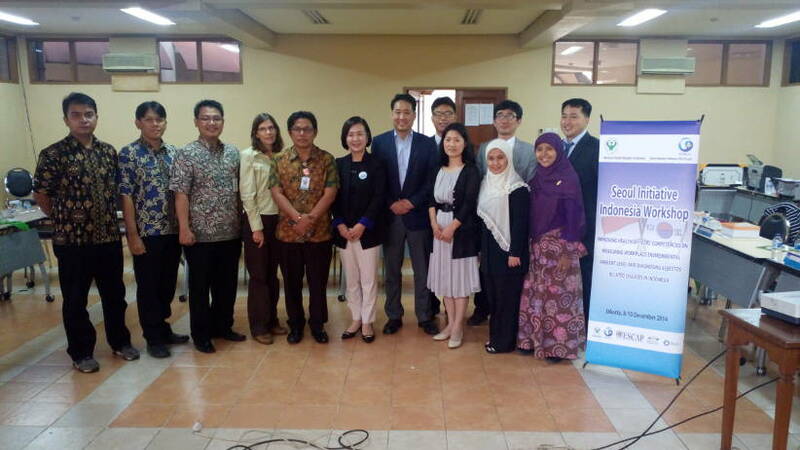 On December 8-10, 2014, the Ministry of Health (MOH) of the Republic of Indonesia in collaboration with the Korean Environment Corporation (KECO) conducted a three-day workshop entitled: Seoul Initiative Indonesia Workshop: Improving Health Officers Competencies on Measuring Workplace Environmental Ambient Level and Diagnosing Asbestos Related Diseases in Indonesia. The first day and a half of the workshop took place in a meeting room at Wisma Makara Universitas Indonesia, in the Depok area of Jakarta. 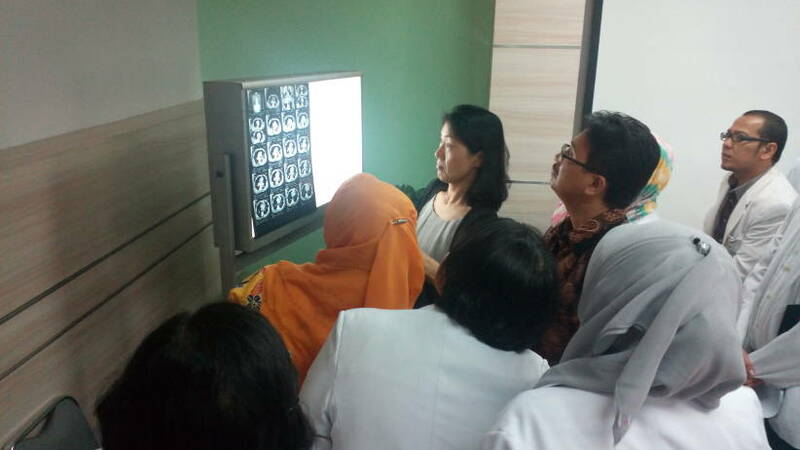 After lunch on December 9, delegates visited the Persahabatan Hospital (RSUP Persahabatan). Some of the workshop participants and speakers. The objective of the workshop training sessions was to improve the knowledge of MOH health officers regarding the diagnosing of asbestos-related diseases and undertaking workplace environmental monitoring. Beside the health officers, the MOH invited other stakeholders on asbestos issues to the workshop including: representatives of the WHO, Ministry of Manpower, Ministry of Environment, and NGOS; participants from hospitals, OSH Lab, Occupational Health Clinic, Health Professional Organization, OH Doctors Association, OSH National Board, Social Security Agency (BPJS), and FICMA (Fibers and Cement Manufacturers Association); and academics, researchers and experts. On the opening of the workshop, Dr Muchtarudin Mansyur, the Director of Occupational Health and Sport, at the Ministry of Health, discussed current asbestos issues in Indonesia. He stated that there were three possible reasons why Indonesia still had no confirmed asbestos cases or data on asbestos-related diseases. The first explanation was that chrysotile asbestos was not harmful to health; the second was that Indonesians had a genetic immunity to these diseases; and the third was that our physicians did not have the knowledge required to diagnose asbestos-related diseases (ARDs). To improve the knowledge base, the MOH decided to work on an asbestos health program with the KECO. Dr Muchtarudin Mansyur addressing the workshop. Several experts from South Korea shared their knowledge and experience with delegates at the workshop. 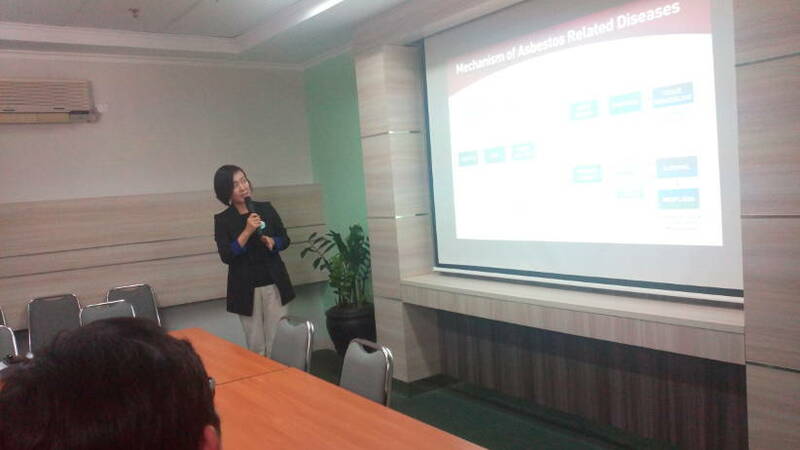 Dr Eun Kee Park PhD addressed the topics of: Asbestos use and Asbestos-Related Diseases in Asia, Environmental Exposure to Asbestos and the Global Epidemic of Asbestos-Related Diseases. Professor Soon-Hee Jung from Yonsei University spoke about the occurrence and diagnosis of asbestos-related lung cancer in Korea. Dr Jeung Sook Kim MD, PhD discussed the Radiologic Approach for the Diagnoses of Asbestos-Related Diseases. In addition, keynote speakers from the KECO including Mr Jeon Seon Sik, Dr Lee Seung-Hoon and Mr Kim Dong-Oh covered topical issues such as the Asbestos Relief System, Asbestos Safety Management and Asbestos Environmental Measurement in Korea. The sessions on December 8 and 9 covered a wide range of relevant subjects. 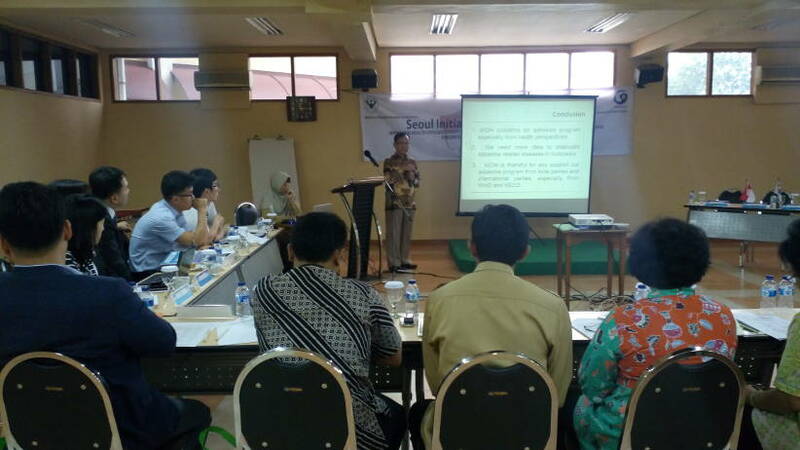 Indonesian experts discussed the current situation regarding the use of asbestos and research on the occurrence of asbestos-related disease. There was a lot of discussion including a lively debate between a representative of the asbestos-cement industry (from FICMA) and a Korean expert. It was clear from the engagement of the workshop participants that there is a high degree of interest in asbestos issues in Indonesia. The support provided by the Ministry of Health and Ministry of Environment for this event indicates the Governments concern to address the countrys asbestos challenge. The fact that delegates from non-governmental organizations (LION and Ina-Ban) were invited to attend is evidence of the political will to devise an asbestos program which is both comprehensive and inclusive. After lunch on December 9, participants had the opportunity for a site visit to the RSUP Persahabatan Hospital for Lung Disease where they heard about the clinical workload, and the diagnosis and treatment of lung disease, at this medical facility. Korean Professor Jeung Sook Kim discussed the use of radiographs for diagnosing ARDs with resident doctors in the hospital. Professor Jeung Sook Kim at Persahabatan Hospital. On the last day of the workshop, the participants went on a factory visit in the Cikarang area, to one of the biggest producers of asbestos roofing material in Indonesia. After the factory visit, we conducted environmental air sampling in the neighborhood around the factory. 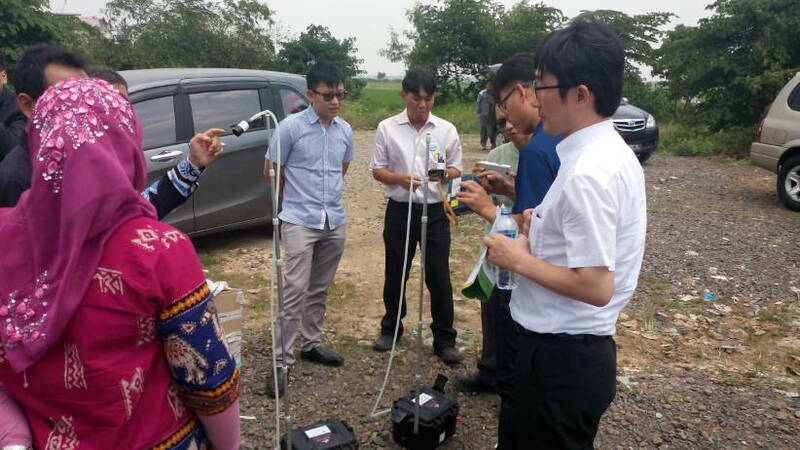 Environmental air sampling in the community around the factory. 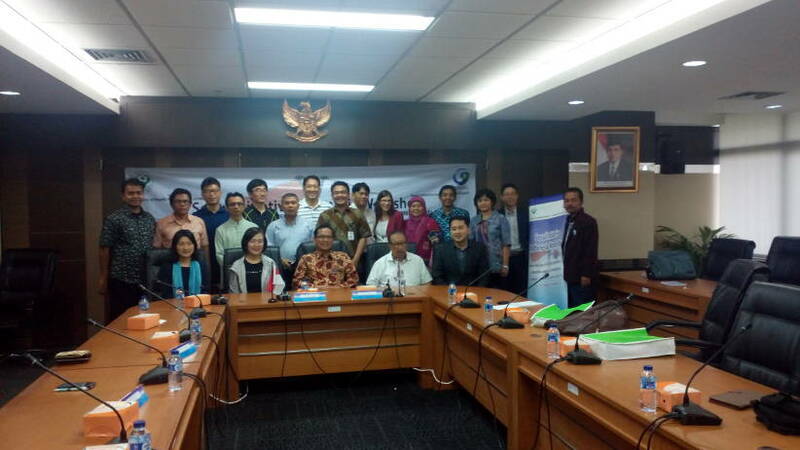 As a result of the workshop discussions which took place from December 8 to 10, it was clear that Indonesia was still lacking research skills and data on ARDs. To address this situation, the Ministry of Health has made an asbestos research agreement with the KECO. The evidence which will be collected as a result of this research will be used to inform our countrys asbestos policy and regulatory regime. Closing Ceremony at the office of the Ministry of Health.